Our Galapagos diving cruises in a combination with the islands hotels,are the best option to enjoy overnight, cruising the islands you can enjoy whale watching,and diving galapagos along the best dive sites. islands to fill their holds with fresh meat. A bus ride into the highlands takes you to Los Gemelos, two deep pit craters situated in the scalesia forest with lots of interesting bird life, or for a trek through the gigantic lava tubes, or to the Tortoise Reserve to search for large tortoises in their natural habitat. On the north shore of the island, accessible only by the sea, is an extensive mangrove lagoon called Black Turtle Beach. Here in the peacefulness of the mangroves turtles break the surface of the still waters, while fish, rays and small sharks cruise below. 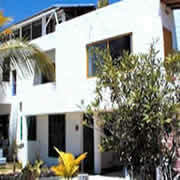 Puerto Ayora on Santa Cruz Island is full of gift and souvenir stores, as well as all sorts of Ecuadorian craftwork. Although the prices are much higher than stores on mainland Ecuador, they are cheaper than the cruise ships’ boutiques.Puerto Ayora is the place to be for nightlife in the Galapagos. In the center of the archipelago, Santa Cruz Island has a fair number of pubs and discotheques that stay open until late into the night. 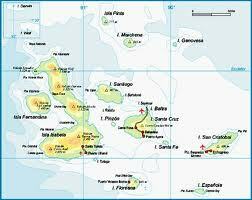 Location: East of Santiago island, a small island with the famous Bartholomew pinnacle, 2 dive sites. 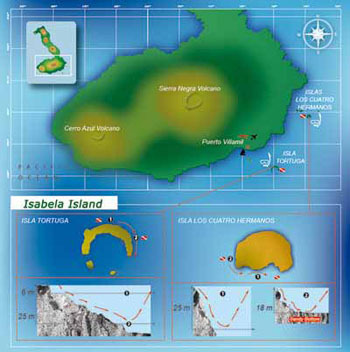 Sailing distance is 1-hour and a half from Itabaca Channel (North side of Santa Cruz island). Site Conditions: Moderate currents. A platform is found at approximately 10 meters where a variety of reef fishes reside. On the edge of this platform there are underwater cliffs which start at about 15 meters deep; good probabilities to observe pelagic species. Marine fauna: White tip reef shark, reef fishes, barracudas, turtles, mobulas, stingrays, variety of invertebrates. Location: Northeast of Santiago island near Bartholomew island, 1 islet, 2 dive sites located an 1 hour and a half from Itabaca Channel (North side of Santa Cruz island). Site Conditions: Normally there are no strong currents at this site; this is partly a reef dive, partly a wall dive where the endemic black coral is found. Marine fauna: sea horses, barracudas, sea lions, Galapagos sharks, white tip reef shark, turtles, reef fishes, sting rays, eagle rays, variety of invertebrates. At surface interval penguins can be observed. Marine fauna: sea lions, Hammerheads, Galapagos sharks, white tip reef shark, hammerhead shark, mobulas, turtles, reef fishes, sting rays, eagle rays, Galapagos eel, barracudas, variety of invertebrates. Location: South of Santiago island, 3 exposed rocks, 2 dives sites located an 1 hour and a half from Itabaca Channel (North side of Santa Cruz island). Marine fauna: sea lions, Galapagos sharks, turtles, reef fishes, stingrays, eagle rays, barracudas, variety of invertebrates, manta rays and probably solitary hammerhead sharks. Marine fauna: here we find a small cave (this is NOT a cave dive) where white tip reef sharks rest, additionally there is a pinnacle where we find a diversity of rays, Galapagos shark, turtle, ref. fishes, barracudas, black coral walls and variety of invertebrates. Created by the lava of six volcanoes that flowed together, this 1800 squared foot island is the largest in Galapagos. Graffiti dating back to the 1800's is written on the rocky cliff left over from bucanneers and whaling ships. The trails lead to a salt water lagoon and offers a great view of the lava fields and the ocean. A Panga ride reveals penguins, shearwaters and noody terns. ● To practice recreational dive activities the diver must be in good health and not under the influence of alcohol or drugs. Passengers who declare health problems will need a doctor’s authorization permitting them to dive. ● Our daily dive tours included 2 dives (except introductory y night dive), two dives, dive boat, divemaster guides, diving gear (complete wetsuit, regulator with octopus, BCD, mask, snorkel, fins, booties, gloves, scuba tuba, tanks and weight belt), lunch . 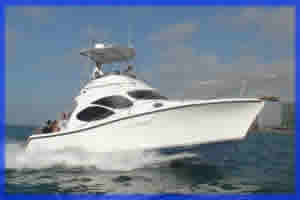 Our dive boat complies with the Ecuadorian Marine security prerequisites and norms. Additionally, our first aid kit includes 2 oxygen tanks (one hour’s duration). We are affiliated to the hyperbaric chamber; our passengers are covered 80% specifically for dive accidents. Average visibility is from 8 to 10 meters (25ft to 35ft); on good visibility days it can reach approximately 18 meters (60ft). From July to December the sea is choppy, strong surge, strong winds. Sailing time is longer (by 30 - 40 minutes approximately) when comparing to calm season sailing time. Anti-seasickness medication is recommended. From December to June the sea is calm with gentle breeze; sailing is easier. Galapagos diving cruises with our hotel based diving is great year around, check our new scuba diving tours, from Santa Cruz,and Isabela islands, includes diving, hiking, horseriding,snorkeling. -transfer to Airport back to home city . Below you find our regular Itinerary to follow, depending on the day of the week you choose. International Arrival in Quito-Ecuador, transfer and check in at hotel. Upon early arrival, city tours can be arranged. 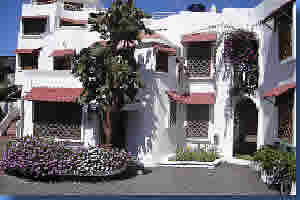 Transfer to airport for flight to Baltra Airport-Santa Cruz island, Arrival , Transfer and check in at a confortable hotel. After lunch,we begin with our first visit to the interpretation center at the Charles Darwin Staion. After we can check our dive equipment for the next diving day , and getting familiar with your personal diving equipment. Day 04 (any day) Santa Cruz island. After breakfast, if the Itineary is floreana, we will have an early departure to the island of Floreana, where we will have one immersion in Champion Isle, one of best dive sites in Floreana, with calm waters most of the time.after Lunch, the afrnoon dive is at the Devil's crown, it is a submerge small crater, Floreana have the smallest population among the 4 inhabitated islands of the archipelago.return to Santa Cruz port. Santa Cruz Hotel, overnight . After breakfast, in a short bus ride, our first stop is Santo Tomas village, from where we will continue by horseback riding, to one of the most active volcanoes on earth, the Sierra Negra caldera, for about hour and a half ride to the top of the rim, a 10 kms wide, the second largest of the world, from where we can have a short walk to one of the main volcano vents, noting the fresh lava activities, from this point you can have an impresive moon-like view of the islands, almost a 1.000 mts. 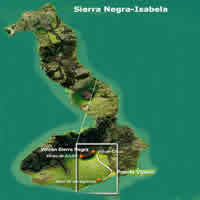 in high.After a fine lunch, we wil begin descending by horse to Santo Tomas, for the return to Port. After Breakfst, we take our fast dive boat to LOS 4 HERMANOS, to have 1 dive in the morning, lunch box, then another dive in the afternoon, then return to port of Villamil. After Breakfast, transfer to Quito Airport for international flights. The Galapagos Islands waters have the Humboldt Current's influence that brings cold waters especially during the mist rainy season (from July to December). During the warm season (January to June), the southeast trade winds become weaker and the water from the Panama Basin remains warm. During this season climate is tropical with some occasional rains. "El Nin~o" current may cause a much greater flow of warm waters, making the surface warmer and rainfall increase.